He's back home, with a catheter and pain meds. He has to go back in the morning. Sorry to hear he has to go back, but glad to hear he's home. Dad decided that he was doing alright, so we're going to wait until tomorrow and take him to our usual vet. Dad was concerned that the vets at the animal hospital were trying to gouge him, which is probably true, and since he's not bleeding out and high on pain killers, it's probably going to be fine. I'm never one for doing things AMA, but it's not my dog, it's my dad's. 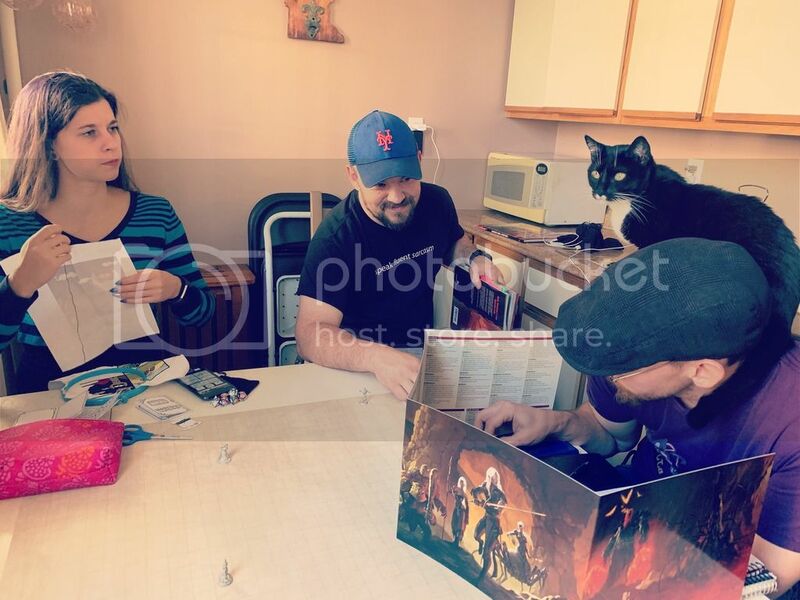 I appreciate my dungeon master’s adherence to the rule that as long as an animal is being cute it can not be moved from where it chooses to be, regardless of how unconfortable it makes you. Found out this week that my new job allows you to bring your dogs to work. Which is awesome. But the caveats are that they have to be well behave and quiet. Which unfortunately (though understandably) leaves me from being able to take my 3 in with me. My guys tend to bark at people they don't know and a new place (like an office) would result in them running in up and down the unfamiliar halls and wrestling in new unfamiliar rooms. Our beagle is sick. Threw up a few times this morning and been sleeping most of the day and hasn't eaten anything all day. Tried the usual guaranteed food for sick dogs-boiled chicken and white rice cooked in the chicken water- and he wouldn't touch that either. Will see how he is tomorrow, but may be taking a trip the the emergency vet. Only had 2 other dogs that wouldn't eat chicken and rice when they were ill. 1 with kidney failure who I could only get to eat steak- fortunately that was back when steak was much cheaper- fed her a cheap $2 chuck steak just about every day for her last year. And 1 with cancer who would rarely eat the same thing two days in a row for his last year. Clark the beagle is eating again and acting more normal today. Did throw up a little early this morning, but seems to be keeping food down now. I've got a mouse in my house. I haven't seen it, but I've found its droppings. And my 3 cats seem really interested in the space behind my oven, so I assume that's where it's hiding. And yet they haven't caught him. C'mon guys, you have one job. I don't mean to brag, but if there's a mouse in our house, anywhere in our house, it is dead effing meat. Our cats are... how shall i say... brutally efficient with their hunting skills? I have no problem with mice, as long as they stay out of my house. I've set non-lethal mousetraps, but so far to no avail. Hey I sympathize. I like Mice too but unfortunately a cats hunting instincts are so deeply embedded that if they see one of those little critters wandering around they're going to enter attack mode. Believe me, I hate seeing dead critters right outside our door. Yeah, dogs and cats hunt. I had a woman scream at me at the dog park last year because one of my dogs was "traumatized the poor ducks" by swimming after them in the pond in the park. She's just lucky she didn't see him kill one that day because he has before. We had a Cheasapeak Bay Retriever who used to catch and kill all sorts of rodents-field mice, rabbits, squirrels, even muscrats. Wasn't ever better happy about it, especially whenever she tried to bring her fresh kill into the house, but it's what animals do. All I'm missing to increase my mischief is the new rats! I've got the stuff for the second cage, just need another pair of ratties to stick in it so we can begin the quarantine and introduction process!